Bordeaux in the Gironde in South-West France is one of France's most beautiful cities and the Bordeaux quays are a wonderful area of Bordeaux in which to rest, relax and shop. Its waterfront area has been transformed recently as part of its urban development project launched in 1996. The development of the Quays running along the banks of the Gironne river were a key part of this. 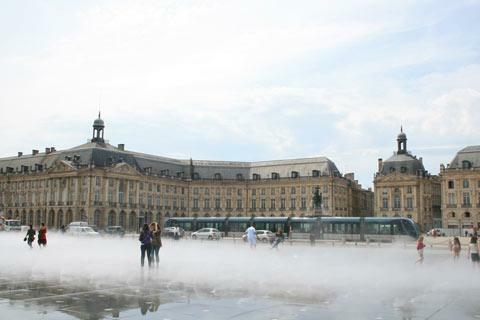 A part of Bordeaux's classical centre lies on the waterfront of Bordeaux. Head to the Quai de la Douanne and here you have the beautiful Place de la Bourse. This was built by the renowned architect Gabriel between 1730 and 1755. On one side of the square is the Stock Exchange (Bourse) and on the other the Customs Museum (Douanne). Now, making the square even more beautiful there is the Miroir d'Eau on the other side of the main road next to the river. This large sheet of water is part of the development project of the waterside. It is shallow enough to walk on and when undisturbed gives a beautiful reflection of the buildings of the Place de la Bourse. At various times during the day jets squirt a fine mist above the water and walking through is wonderfully refreshing on a hot summers day. Along the rivers edge a wide boulevard is used for walkers, cyclists, roller skating etc and a number of interesting gardens have been planted too. 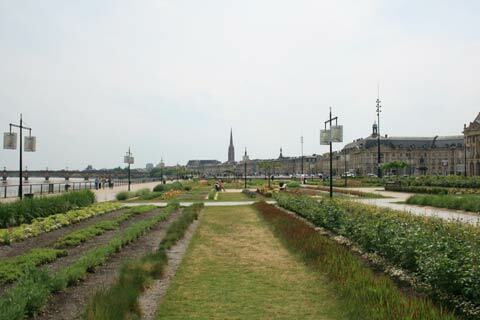 Walk along the rivers edge through the different Bordeaux quays and as you walk admire the river on one side and the gardens and the beautiful buildings of Bordeaux on the other. A little further along from the Place de la Bourse is the Esplanade des Quinconces. This is the largest square in Europe and covers 12 hectares. 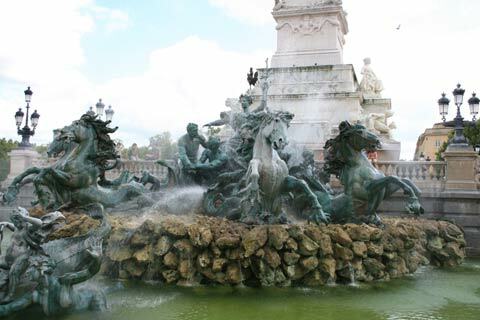 At one end is the Monument aux Girondins with its 50m high column and at its base a magnificent fountain with bronze statues depicting the triumph of the Republic over vice, ignorance and lies. The Esplanade des Quinconces is used regularly throughout the year for brocantes, fairs, circuses etc.There are two other columns and statues of Montesquieu and Montaigne also in the square. Continuing along the waterfront the next attraction is Bordeaux's Contemporary Art Museum (Musée d'Art Contemporain, CAPC). 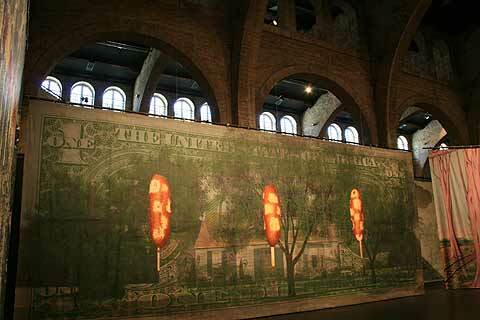 When there are no visiting exhibitions the museum is free, otherwise there is a small charge. It is housed in a very atmospheric 19th century shipping warehouse originally used to store goods from, India, America, Africa and the West Indies.Visiting exhibitions obviously vary but the day I visited there were two excellent exhibittions including an architecture exhibition by the Bjarke Ingels Group - fantastic. 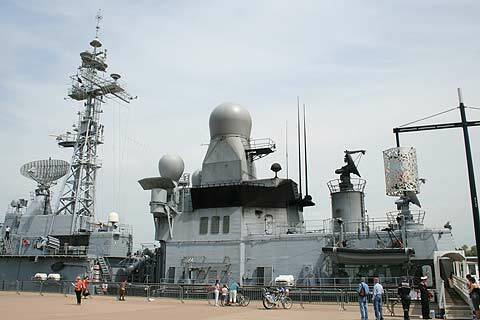 The Quai des Marques is part of the Quai des Chatrons key and is a 10 minute walk along the waterfront from Place de la Bourse. 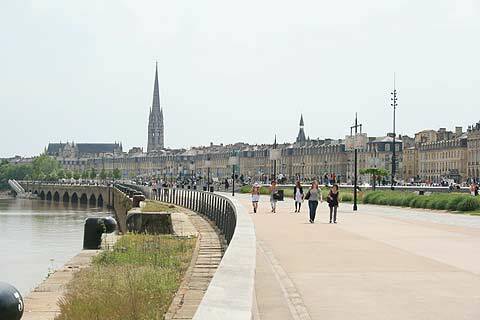 Its a lovely walk but if you are in a hurry you can take the tram which runs all along Bordeaux's waterfront. Take Tramway Ligne B and get off the station at the Station Les Hangers or Station du Medoc. Parking is also free and easy if you arrive by car. 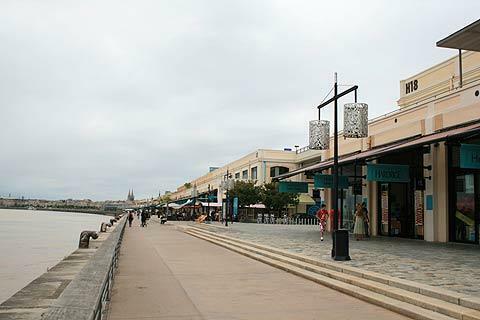 The Quai des Marques is home to designer outlet shops such as Calvin Klein, Hugo Boss, Princess Tam Tam, Nike, Le Creusset amongst others, making this quay particularly popular. 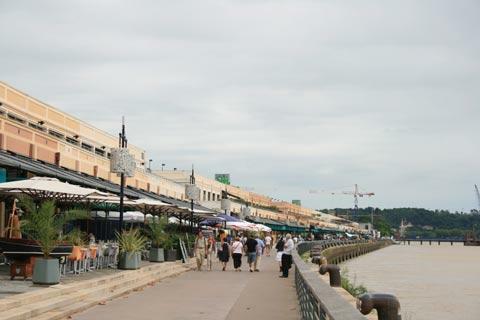 Also on the Quai des Chatrons are a really good selection of cafés, all along the river edge. The menus are competitively priced, the food good and the ambience excellent. This is one of Bordeaux's best areas for eating. Whilst you are here walk up behind the Quai des Chatrons to the Rue Notre-Dame which runs parallel to it. Along this street there is some excellent architecture to see. The oldest houses on the street are numbers 37 and 61. Number 29 is full of some lovely details around its windows and was once home to a turkish baths. 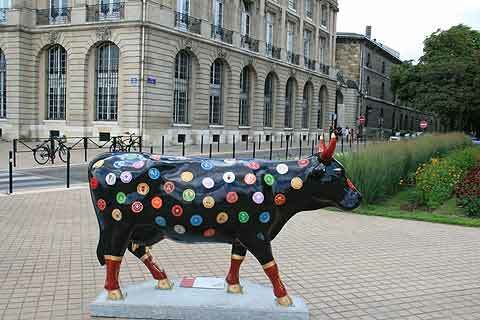 Continue down to Quai Bacalan for one of the biggest suprises of Bordeaux. Here at the end of the Quai de Bacalan there is a little inlet of water running perpandicular to the river. This turns into two areas of water - Bassin à Flot No 1 and Bassin à Flot No 2. 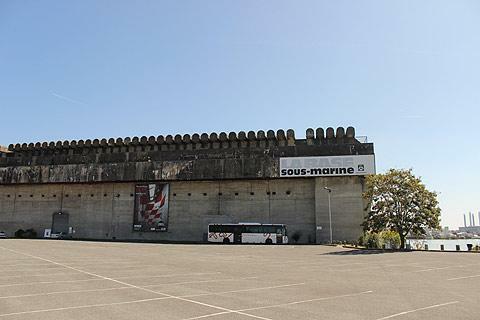 In Bassin 2 there is a large concrete structure which was built by the Germans in 1941 to shelter their U-Boats! 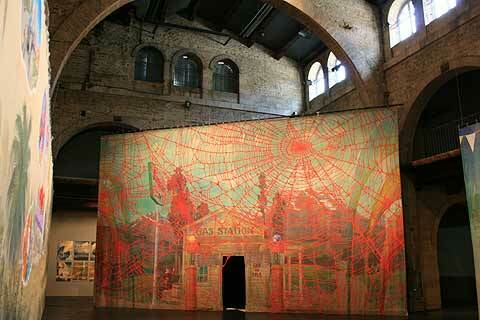 It is a very imposing place to visit and is also now an art gallery and concert hall. Also near here are Hanger G2 which is home to some trendy restaurants and the FRAC - Fonds Regional d'Art Contemporain which includes works by Cartier-Bresson. 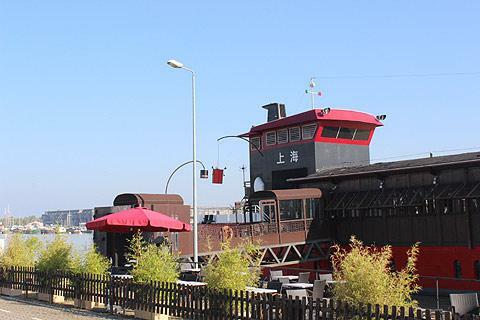 Also is an old boat which has been painted black and red and turned into a Chinese restaurant and night club - la Dame de Shangai. Walking back to the centre of Bordeaux from here offers some stunning views of Bordeaux's Golden Mile.